Brewing great beer requires technical expertise and intuition. Our brewery unites one brewer's experience, education, and passion with a creative vision, regard for tradition, and collaborative spirit. "Das Sudhaus" is the traditional German term for the critical vessels in a brewery. Our brewery was designed by us and fabricated locally to support the flexible needs of a farm-based brewery. Our brewhouse is a mash-up of the traditional 3- and 4-vessel systems. It includes a lauter tun, a mash tun and 2 multipurpose boil kettles. These two kettles transforms the capacity of our 5-barrel system to that of a 10-barrel set-up! We have five 10-barrel fermenters, and room to expand when the time comes. The whole brewhouse runs on electrically generated steam, allowing for the production of clean, flavor-stable beers that are easy on the palate. The brewhaus vessels as well as the fermentors are all clad in hard wood planking sustainably harvested from the farm and its surroundings. The wood was carefully chosen for its rot resistance, a trait vital in the steamy, splashy brewery. Each species has a distinct look: dark and smoky Black Walnut, syrupy pink Honey Locust, and green and grainy Sassafras. Can you spot them all? Brewery owner. Brewmaster. Porcine visionary. Craftsman. Team player. And janitorial lead. Given the number of hats he wears, we just call him Kevin. Raising wooly pigs and running a brewery simultaneously on the same land doesn’t sound all that compatible. But once you get to know the team, it will make perfect sense. 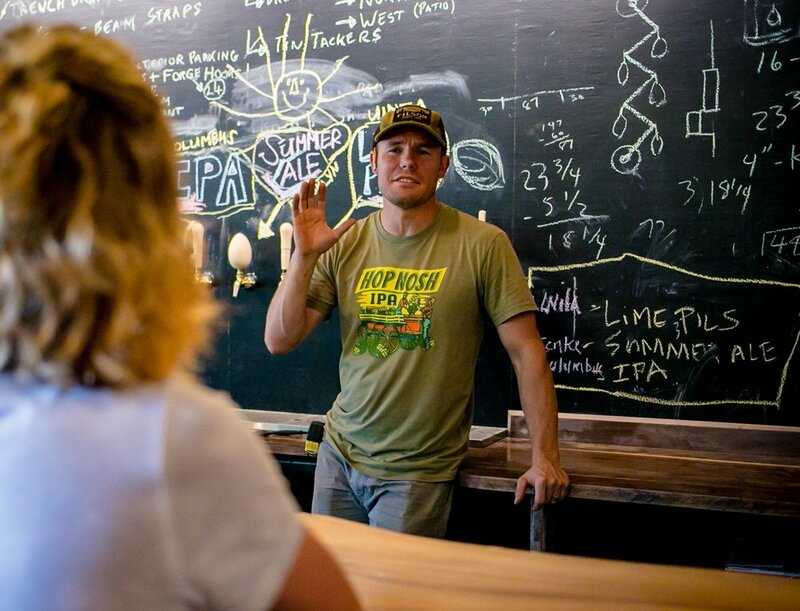 Kevin Ely, a former brewmaster of Salt Lake City’s Uinta Brewing Company, a top-50 craft brewery in the U.S. by volume, holds a degree in brewing science from UC Davis. In short, he knows how to brew good beer. But about those pigs? That’s a story that is best told over a beer. Top Row: Patti and Todd, Lauren and Aaron. Middle Row: Jael and Kevin. Bottom Row: Soren and Astrid, Auggie and Silky Nils. Present in spirit: Nate and Lucy. Photo: Ben Croghan. Meet the Malenkes. It’s a family affair. It takes a great team to make great beer, and this team is united by love for each other, dedication to the land, and a shared quest for the next great brew.